why Ron/Hermione pwn Bella/Edward. . Wallpaper and background images in the 哈利·波特与暮光之城 club tagged: twilight edward cullen funny bella swan harry potter twilight series. This 哈利·波特与暮光之城 fan art might contain 商务套装, 西装, 报纸, 纸张, 杂志, 小报, 抹布, 纸, 标志, 海报, 文字, 黑板, and 文本. See 你 in a bit! 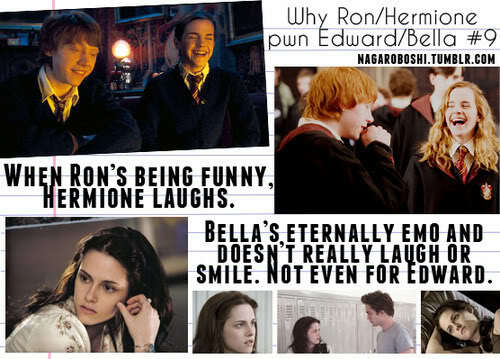 With the exception of the time he and Hermione were in a fight and Ron made fun of her. Why Twilight is better than Harry Potter-The real reasons 你 asked for.